“This is awesome,” Hannah said as the five of us picked ourselves up off the floor. “I’m sorry—what is awesome exactly?” I responded, willing my knees to cooperate. “This. Talking about being Catholic, together. I go to public school. We don’t do this at public school. And you know, it’s the Bay Area. We don’t talk about religion like this here,” she explained. My four teen-aged charges and I had deviated from my Confirmation lesson plan yet again, and the conversation that ensued was characteristic of this group—thoughtful and compassionate, curious and careful. Having had every intention of guiding them through an exploration of the depths of Catholic tradition, I had been (less than) surprised when all four of them admitted to having left much of the admittedly dense reading for the day aside. As a result, we did a bit of faith sharing and looked to our book’s discussion questions, the first of which read, “What attracts you to the Catholic faith?” When it was my turn to respond, I had waxed eloquently about Mystery and smallness and family. Not untrue, just missing the mark. Committing to Catholicism feels more like an ongoing negotiation than a once-in-a-lifetime choice. 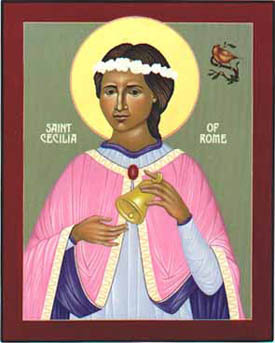 Sure, I took the name Cecilia that Saturday morning when the bishop smeared what felt like too much oil of chrism across my forehead, together affirming my parents’ decision to baptize me. But that didn’t prevent me from continuing to question the tradition I claim as my own. And that questioning isn’t a matter merely of voicing doubts, either; it’s not a lack of faith. On my best days, it’s part of an earnest and hopefully lifelong journey of sincere faith honestly seeking genuine understanding. “Remember what happened to Adam and Eve when they tried to eat of the Tree of Knowledge?” I can hear someone who sounds an awful lot like my second-grade teacher saying in the back of my mind. “We’re not meant to understand everything about our faith.” Perhaps not. But the alternative shouldn’t be to neglect critical engagement with what we profess to be true. For a long time, I felt like this critical engagement subverted my faith, made it difficult for me to stand on sure ground in stating, “I believe.” Whether it was the way the teaching of the magisterium regarded women or our LGBTQ brothers and sisters, members of other traditions or those of no religion at all, I felt that ground crumbling beneath me. But more recently, I’ve begun to embrace this critical engagement as my own way of being faithful. And I’ve come to see that I don’t need to stand on sure ground so much as make the road by walking it. Jennifer Owens serves as Faith Formation Minister for Teens and Young Adults at St. Augustine Catholic Church. She studies Christian spirituality in the doctoral program at Graduate Theological Union in Berkeley, CA. Names have been changed to protect the identity of minors. “Committing to Catholicism feels more like an ongoing negotiation than a once-in-a-lifetime choice.” May I quote you on this? Frequently? Oh my, this post, which I happened upon via Dan Horan’s FB page, has given me water and life in a parched day for this committed but weary Catholic. There is simply no accounting for grace, even on FB. Absolutely, Fran! Thanks for your kind words. Do feel free to quote the piece and re-post! Peace and blessings be with you along the way. It is already on my Facebook page. I am on a mini-blog break, but I can see myself linking to you! Thanks Fran! You might want to check out the book that my friend and colleague Kate Dugan and I put together a few years ago, From the Pews in the Back. Our website is fromthepewsintheback.com, and there should be a link to order the book in the top right corner, if you’re interested. The contributing authors, Kate, and I have pushed pause on our blogging efforts for now, but you might like some of what you find there if this post resonated with you. Hope our paths get to cross in person some time! Thanks! I am very pleased to make your acquaintance and I will check out the link and the book! “Critical engagement” is the way to go, for sure. I found my way to your blog via Fran’s comment on FB. I, too, am going to pull a quote from your fine post to put on mine. Thanks for your support, Meredith! I hope your experience of Lent is a fruitful one.